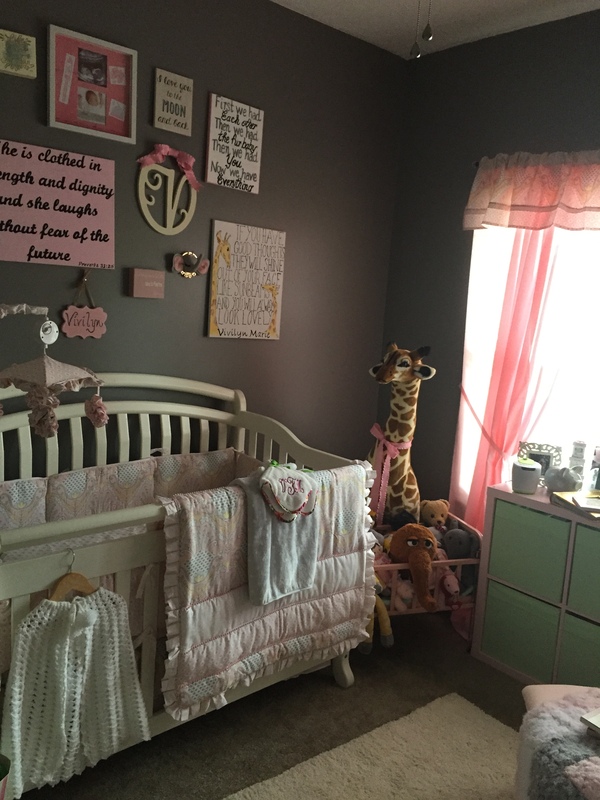 With our precious Vivilyn about to make her arrival, I wanted to take some time now to share her nursery. I have enjoyed decorating her room more than any room in my house. I have put so much thought into each and every little piece because I feel like our little miracle deserves the best. When I found out that I was having a girl, in my mind, there was no other option but pink! I know it is cliche but that is joy in having a little girl. 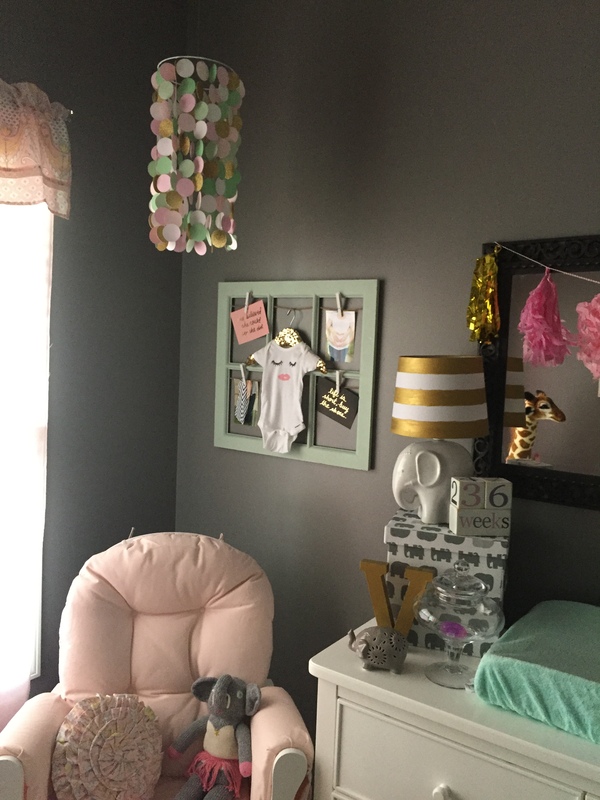 We did try to tone down the girlishness with grey walls and mint accents, but you can definitely tell this room belongs to a little princess. Her crib and bedding were the first pieces that we bought. We decided to go with white furniture so she could use it through her life. The crib is also a “grow with me” crib so we will not have to purchase a bed as she gets older. Her bedding is from Amazon by a company called Dena. The pattern is called Lily. I have linked it here if you would like to purchase for your own nursery. Her next piece of furniture was a dresser from Target. 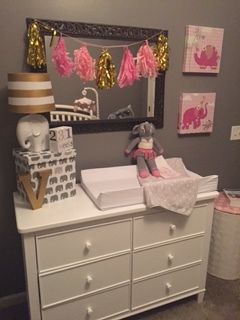 We went with the dresser and changing pad option so that she could use the dresser as she got older. 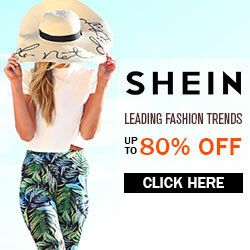 I have linked the same model here if you wish to purchase. 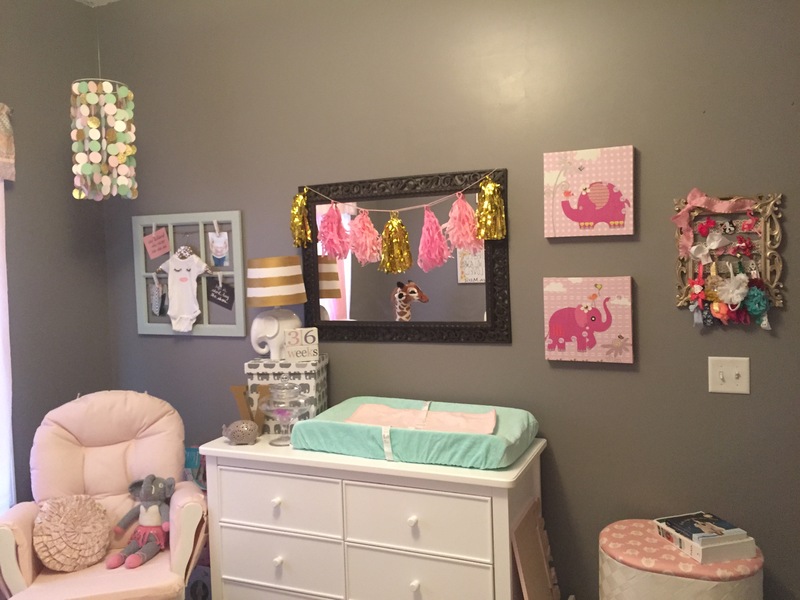 As you can see, elephants also became a part of the nursery theme. They had such cute elephant decor at Home Goods that I could not resist!! Her last piece of furniture was a glider that was also purchased from Target. 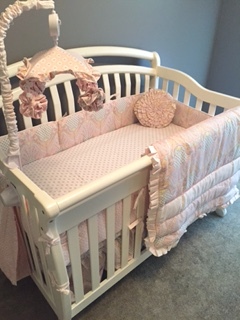 I wanted something so that I could rock and snuggle my little bundle and I loved the soft pink cushion. This glider is super comfortable and comes with the ottoman! 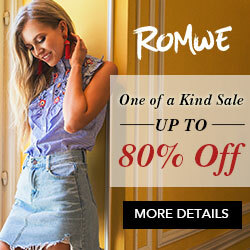 I have linked the same model here if you wish to purchase!! We also purchased a small shelf with organizing cubes from Ikea. It is perfect for organizing blankets, small toys and other supplies and will be great as a toy chest as she gets older. The valence curtains were purchased from Amazon in the same print as her bedding and the panel curtains were made by my wonderful mother. 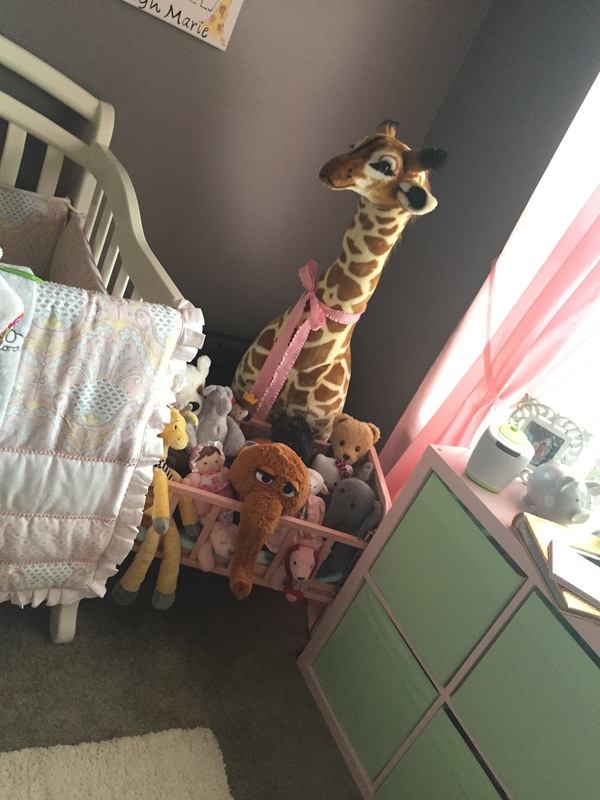 One of my favorite things in her room is the large giraffe by Melissa and Doug. 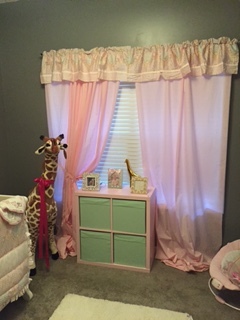 Giraffes are also a part of her decor and go well with the colors and the elephants. The giraffe was also purchased off Amazon. The last major thing that we did was remodel her closet. 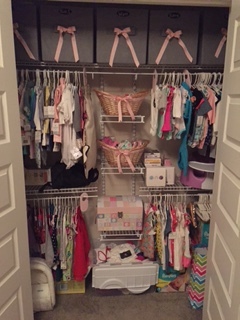 It was a double-door closet with a bar and rack across the top, but that was just not feasible for little baby clothes. I sketched out what I had in mind for her closet, took my sketch and measurements to Lowes and they helped me to purchase exactly what I need. They even cut down the racks for you to fit your measurement. This was individual pieces from the Rubbermaid system that my husband installed. It was fairly easy to install, just time consuming. The system is completely adjustable so that we can make changes as she grows. The baskets were just purchased from Wal-Mart and I customized them with a little pink ribbon to add a little girlie touch! 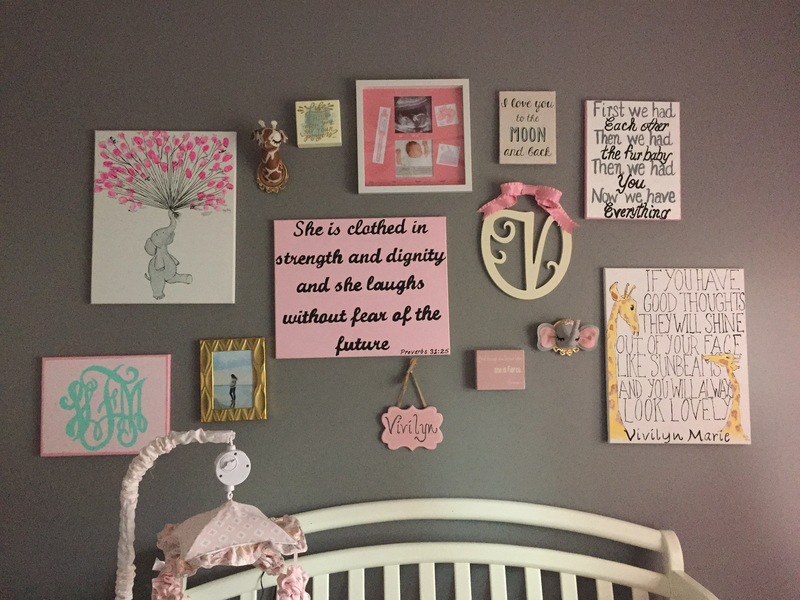 The last major part of Vivilyn’s nursery is her gallery wall. 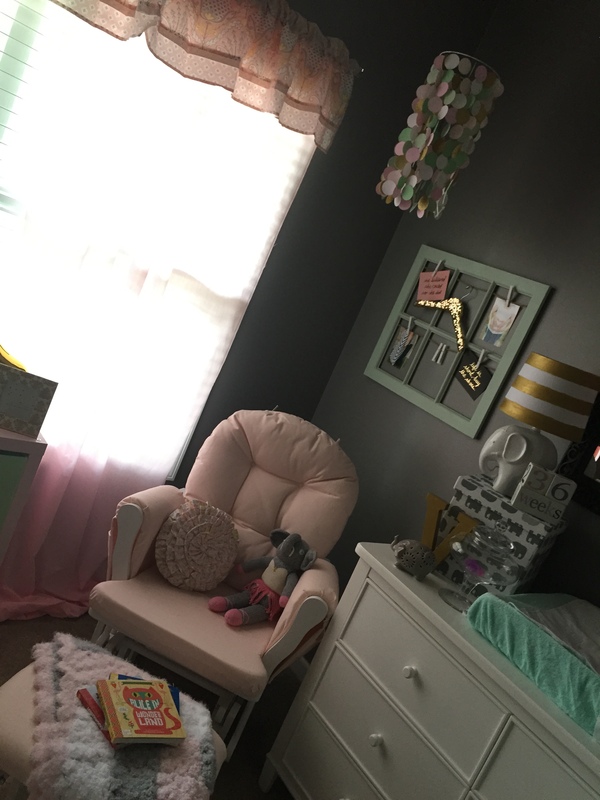 I love gallery walls and knew that I wanted one to be a part of the nursery. 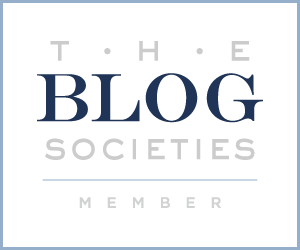 I started picking up little things and pinning things on Pinterest to get some ideas. All of the canvases are hand-painted by my super talented Mom. I would send her something that I wanted off Pinterest and she made it happen! There is also a custom giraffe and elephant taxidermy head that I purchase off Etsy from the store Misfit Menagerie. Her work is absolutely adorable and you really should check it out. There are also a few pieces that I purchased from Kirklands and a sweet shadow box from my Sister-in-Law that I cannot wait to fill with Vivilyn’s things. 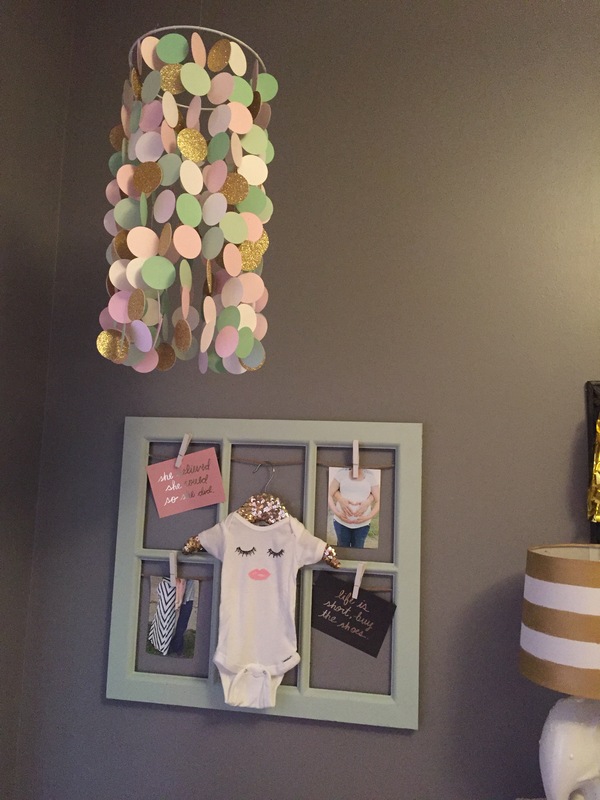 I recently got in the mail this beautiful, custom mobile from Four Glittered Geese on Etsy. I love shopping small businesses and try to whenever possible so when I saw this mobile I knew that I needed it for the nursery. She has many mobile designs listed in her store but she can make a custom one in any color or pattern that you desire. 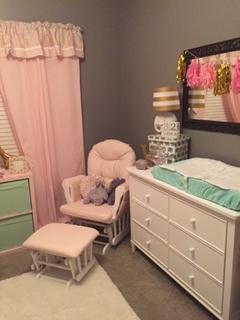 Mine was custom made to match the colors in the nursery. Also, how cute is the onesie hanging from the frame??!! My Mom painted it to look just like a shirt that I have!! The little baby bed that is holding all of her stuffed animals actually belonged to my grandmother when she was a little girl. I am truly blessed that she gave it us and think it is so special that Vivi will be able to play with it, just like her Granny Mary did when she was a little girl. 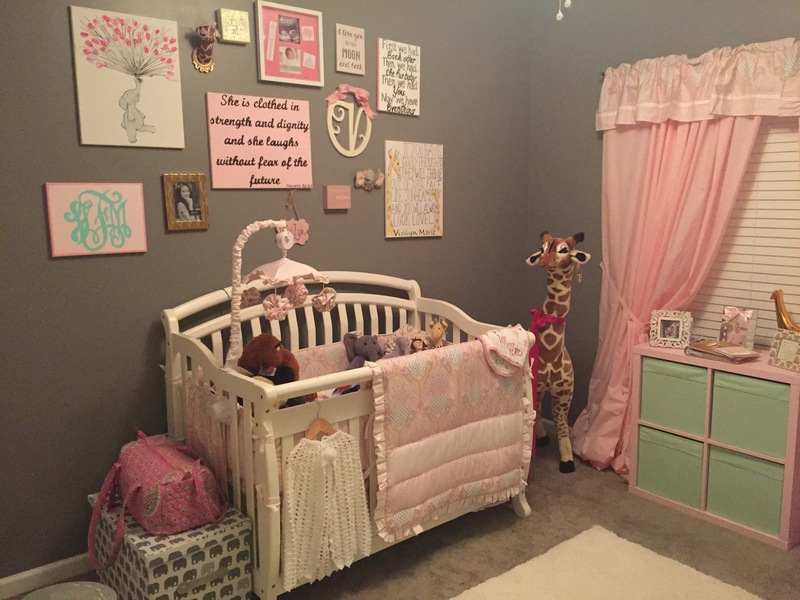 Now the only thing missing in this nursery is our little princess! I can see myself holding her in my arms and rocking her in the glider to sleep. Hopefully she makes her arrival soon and our lives with truly be complete! Let me know if you have any questions about anything else in the room in the comments below!! Everything is beautifully pieced together, Megan. I love it!